In celebration of its 60th year in the apparel business, Guitar has launched a fitting face to represent its brand through multi award-winning actress, celebrated performer and TV personality Maja Salvador. Maja Salvador launched as the new face of local apparel Guitar, which celebrates its 60th anniversary this year. 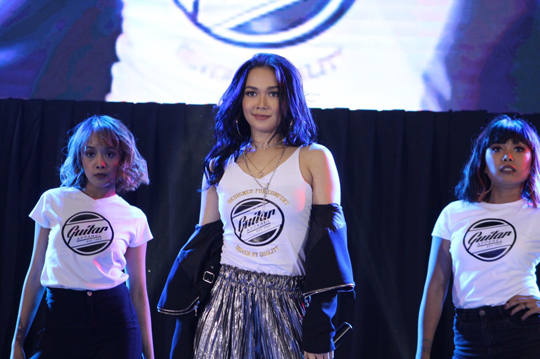 The brand welcomed the Dance Princess as part of its family in a grand media launch in Trinoma event center last March 1 with a head-turning fashion show showcasing its old and new collections together with past endorsers Gloc-9 and Carlos Agassi. Just like the brand that continuously evolves, Maja has changed and excelled in her career, initially as an actress, then branching out into dancing and singing and eventually into performing on the concert stage. She even earned her own stripe abroad through her various portrayals, more recently through her phenomenal performance in the now defunct top-rating series, Wildflower. “It’s a dcome true for a local brand to choose me as their endorser. I’m very proud of the brand because it’s available para sa mas nakararami nating mga kababayan. As an artist it makes me relate well with the mass audience. That’s why I’m thankful to Guitar family for choosing me as their ambassadress,”Maja says. The 30-year-old actress is now officially part of the league of other accomplished and diverse artists namely Gloc 9, Carlos Agassi, and Jake Cuenca, whose characters gave justice to the brand and has been part of its six decades of triumph. Apart from celebrating its strong presence in the local scene for 60 strong years, Guitar is also launching its first denim collection. The denim series is focusing on providing style without displacing comfort. The denim series is the latest member of the Guitar collections such as De Hilo, 800, 900, Underwear, Polo Shirt, Socks and the Uniform series that have been one of the most patronized innerwear and casual wear by Filipinos through the years. From underwear and its breakthrough De Hilo series, Guitar is now ready to take on the world of overall clothing and apparels while maintaining the best quality products and best business practices. Guitar apparel is available in leading department stores nationwide. For updates about their latest collection and sales, follow Guitar on Instagram at @guitarapparel1960.